Michele Rich started out in the radio broadcasting industry and quickly moved into motion picture and television post production in Toronto. In 1992 she moved to the Collingwood area to be with her husband, Mark. In 1993 Michele started a six-month contract to plan a conference for The Environment Network which evolved into an incredible 16 year experience. Through her work with The Environment Network Michele has gained immense respect for the natural world and the people in her community. Michele continues to work with the organization in varying capacities depending on the project of the day.Over the years of working with the Environment Network Michele has encouraged environmental improvement through community action with projects such as EcoENERGY, Well Aware, Active and Safe Routes to School, habitat creation and restoration, stream rehabilitation, pesticide reduction, and of course alternative & active transportation through the creation and promotion of trails.Michele’s work with both the public and private sectors has provided her with a variety of experiences working with people to facilitate the creation of community environmental strategic plans and most recently Sustainable Community Plans. This experience encouraged Michele to return to school to study in detail a Framework for Strategic Sustainable Development. In addition, Michele is often at the centre of controversial issues and is able to bring parties together in order to understand the true issue and reach agreement. With her production background, Michele’s specialty is “making it happen”. Kerri was born and raised in Collingwood Ontario. Once she had completed high school her journey took her out to the west coast where she studied Environmental Science at Langara College. She then continued her education in Calgary, Alberta and took a one year post degree program in Water Pollution at Mount Royal College. Kerri returned to Collingwood in 2002 with her husband so they could raise their children with family and friends around. In 2003 she started working for the Environment Network on a Job Creation Program rehabilitating streams. Once this field work ended she then moved into the office and became the Program Coordinator of the Environment Network. Kerri enjoys teaching her children about the environment and how to live in it without destroying it. She loves walking her children to school and looking at the mini ecosystems along the way. Kerri also loves skiing, hiking, swimming, running, volleyball, baseball, and really anything that can take her outside. Lea is from England, having come to Canada last November. He has recently graduated Worcester University with a sport and exercise BSc (Hons). His work with youth in sport is extensive, but more importantly it’s his involvement with sport and disability that really stands out. During his time at university he coached wheelchair basketball and a basketball session designed for children who suffer from dyspraxia. In addition he worked as a basketball coach for the surrounding Worcestershire community, entering schools and providing weekly sessions. Furthermore, Lea has just returned from the USA working at camp Kennybrook, where has been serving as a senior basketball coach / camp councilor, a position he has held for 5 years. Its Leas experience and knowledge that makes him the perfect role model for members of The Crew, having traveled around the world working with youth, his diverse coaching background, and his ability to connect makes us here at the Environment Network feel very privileged and thankful. Abby Stec is a certified Nutrition and Wellness Specialist and a LEED® Accredited Professional. She attended Sheridan College in the area of Fitness and Nutrition and did a one year apprenticeship with the Canadian Centre for functional Medicine under the direction of Dr Michael Lyon. Abby has been teaching in the area of nutrition for the past 10 years and has worked with the variety of professionals doing consulting work and clinical studies pertaining to the affects of nutrition on children's cognition levels. Abby was the founding Chair of the Simcoe County Eating Disorder Association and and sat on the Eating Disorders Advisory Committee at Royal Victoria Hospital for 6 years. Most recently, Abby has worked as Devlopment Officer at Pretty River Academy where she is facilitation the certification of LEED® for Existing Buildings, Operations and Maintenance. Abby is a member of the Canada Green Building Council and the Association of Fundraising Professionals. For Stephanie, it’s been video since day one. As a child, if you needed to find her, it was best to look behind a video camera. So naturally when it came to her education, she completed Television and Video Production Studies at Canadore College in North Bay. Upon graduation she opened her own bilingual video production company honing her craft in both of Canada’s official languages. But then Steph was ready to play. That’s because when it comes to life, Steph is all about finding the perfect work- play balance. So in 2004, she settled here in Collingwood ready to “play” in the waters of Georgian Bay and on the slopes of Blue Mountain. While continuing with video, she found an incredible opportunity working with the Environment Network. She spent six years initiating programs that improve the quality of life of others in the Georgian Triangle. Her initiatives with youth, the environment and education have been extremely valuable to our community. Well, it’s amazing how life comes full circle. Steph now finds herself back in video at Switch Video. Only she’s not behind a camera. She’s the woman who wears all the hats of video production. She’s a producer and oh, she keeps this whole place running smoothly from the ground up. (She is the operations manager too.) Stephanie brings passion and heart to everything she does. Stephanie considers herself lucky to continue her work with the Environment Network as a member of the Board of Directors. 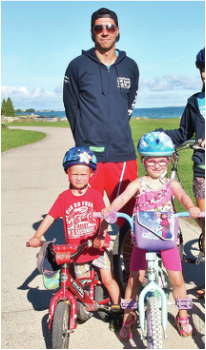 ​ Jeff and his family moved to Collingwood in 2014 to pursue their love for the outdoors and live an active lifestyle. Since he arrived he has been involved with the Environment Network while also helping out with the Blue Mountain Watershed Trust and the Collingwood Trails Committee. Last spring, Jeff completed the Ontario Master Naturalist Program at Lakehead University where he learned about the flora and fauna Simcoe County. Using this knowledge and his passion for reptiles and amphibians, he founded the Collingwood Turtle Watch <https://www.facebook.com/collingwoodturtlewatch/> . The goal of the organization is to help turtles cross the road safely while also creating awareness of the local species. Jeff’s enjoys biking, hiking, camping and gardening. Whether it’s on the mountain or in his own backyard, being outdoors where you’ll find him.